Newstripe's NewRider 1000 is a fast and efficient machine that allows you to line large, multifield sports facilities. Its large, 30-gallon tank can paint up to 12,000 feet of 4-inch line. The unit features a 6.5-horsepower OHV engine, five-speed transmission, front or side-mount dual spray heads, hand wand for detail work, and a garden hose connection for flushing the system. Newstripe also manufactures a complete line of dry line and wet line markers, stencils, dragmats, infield grooming attachments, and nail drags, all of which are backed by an 18-month warranty. The AstroPlay® brand surface, made by SRI Sports, Inc., has been chosen for many service academies including the Military Academy's Michie Stadium, the Naval Academy's Rip Miller and prep school fields, and the Air Force Academy's baseball infield. AstroPlay® is a revolutionary synthetic field surface engineered for athletic competition and play. From professional sports leagues to high schools, colleges to military academies, park and recreation departments to pay-for-play facilities, AstroPlay® is a superior choice. EventDeckTM is a rollable temporary flooring and pathway system that provides access and natural and synthetic turf protection for sensitive sports fields and tracks. It provides a firm, comfortable floor for all types of events and gatherings. Whether you're planning a concert for 60,000 or a graduation for 200, EventDeckTM is an effective alternative to costly tarps, built-up wooden floors, staging and decking. Each EventDeckTM module distributes weight and prevents grass and turf from being damaged by crowds and equipment. A specially designed canopy helps retain moisture and keeps grass looking great, even after several days of use. Save money, time, maintenance hassles and bad calls with PermaLine, a patented permanent synthetic grass line for natural grass athletic fields by PermaLine Sports Inc. The lines are easily installed, and ground crews can mow the field and lines as usual. PermaLine has an expected lifespan of 10 to 15 years, with a five-year warranty that covers premature wear and UV degradation. 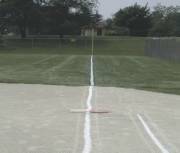 With payback periods for baseball foul lines averaging one year, PermaLine redefines athletic field lining. Permanent lines are also available for soccer/football fields, as well as PermaGolf, offering permanent hazard markings for golf courses. GeneralSports TURF is a fully integrated design/build synthetic turf company specializing in expert, professional product development and marketing; precision construction methods, supported by certified training of installers; and high-quality customer care. Using only premium components, GeneralSports TURF manufactures products to stringent specifications by the industry's leading suppliers. Customers can be assured of superior service in order to build long-term relationships based on a demonstrated reputation for excellence. GeneralSports TURF markets a brand of infilled athletic fields called GameDay Grass MP, specifically engineered for colleges and high schools that need a high-quality, durable product without sacrificing playing performance. The Secur fence systems by Omega II are recommended for projects that require high levels of security and safety. In high-risk areas and overly abused locations, Secur can resist the onslaught of motivated trespassers. The unobstructive see-through panel allows monitoring beyond the fence. Secur panel sturdiness comes from heavy-gauge wire, welded at each intersection. The panels, with 2-inch-by-8-inch openings, are mounted on square posts with heavy-duty brackets and retaining bolt and tamper-proof nut. The panels are hot-dipped galvanized then polyester powder-coated. Standard colors are black, dark green and taupe brown with textured finish. Optional colors are also available. The athletic field lining equipment from Trusco Manufacturing Company is offered at a budget price. These units are rugged and simple to operate. The CO2 cylinder can spray approximately 20 complete football fields (lines, numbers and hash marks) before you'll need to refill it. Diamond Pro offers a complete line of professional groundskeeping products including infield conditioners, calcined clay, mound and homeplate clay or bricks, marking dust, and infield and warning track mixes. Diamond Pro provides fast and convenient delivery. Diamond Pro's vitrified clay Red infield conditioner is available in bulk nationwide and is easy to handle and apply. Truckloads are available in 10-, 15- and 24-ton loads that save you both time and money. So you can enjoy bulk savings nationwide, while creating an all-around safe professional infield playing surface.